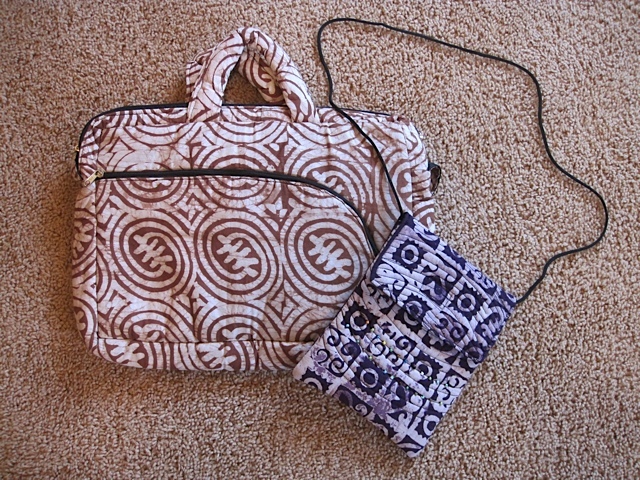 If you saw me on my Sonoma Rose book tour earlier this year, you might have found your eye captivated by the beautiful batik purse and computer bag I brought along on my travels. Earlier this year, I happended to meet Point Hope Executive Director Jan Haynes in the green room of the Wisconsin Public Televsion studios, where we were both taping episodes of Nancy Zieman's program, Sewing with Nancy. I was delighted to see Jan's photographs of the women from Ghana batiking the very fabric from which my computer bag was made. You too can support these entreprenurial women of Ghana by purchasing a batik bag through Point Hope. When you visit their website, you can also learn more about the important work Point Hope accomplishes both here in the United States and abroad, and you can discover other ways you can support their mission. I love the idea of women supporting other women in their efforts to become self-sufficient, independent, and prosperous—especially stitchers supporting other stitchers!